How do you make decisions? Are you impulsive or are you deliberate? The study of behavioral economics tells us that all of us are both, dependent on the situation. We have two different systems for decision-making. We think fast and slow, as Nobel prize winner psychologist Daniel Kahneman would say. When the stakes are low, we are able to use our “automatic,” system of decision-making. Think about the last time you were doing food shopping while hungry. Perhaps you stood there, in line, waiting for the cashier and decided, “Sure, I’ll buy a candy bar.” The candy bar is inexpensive, it’s a brand that you know, and you’re hungry. It’s easy to make automatic decisions because you have pretty much all of the information you need on-hand without giving that candy bar a second glance. For companies in commoditized industries or those competing at lower price points, clear branding comes heavily into play—these brands need to be top-of-mind because they don’t have the time to get into the nitty gritty of why you should choose their brand over others when you’re taking 10 seconds to make your selection. 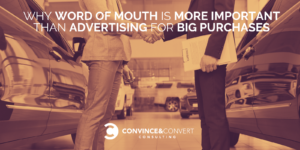 However, in a survey conducted by Convince & Convert and Audience Audit and presented in “Chatter Matters: The 2018 Word of Mouth Report,” advertising was only the eighth most valued source of information when we make substantial purchases. Why is that? Well, most companies have longer customer journeys than those 10 seconds in the checkout aisle. That’s why in his book, Youtility, Jay Baer talks about the value of content marketing to create touchpoints and opportunities for brands to build a relationship with their customer. 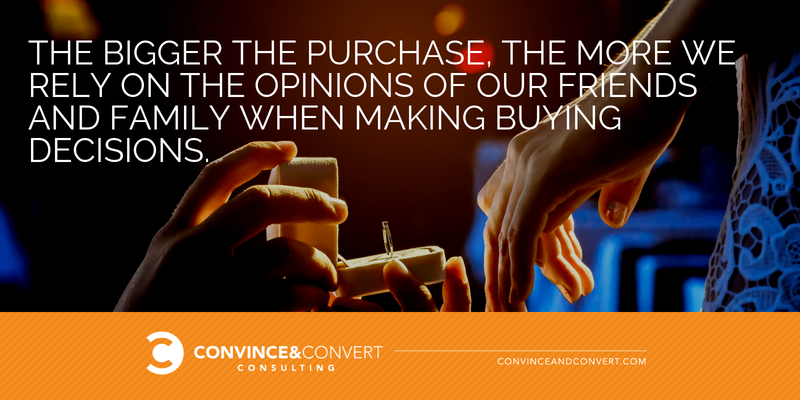 But what if there is another avenue that marketers tend to overlook when it comes to helping customers make decisions? This leads to the number of the day: 331%. This number represents the fact that Americans rely on word-of-mouth recommendations more than three times more than they rely on advertising when it comes to wedding planning. After all, most people will only have one shot at getting their weddings, right? Within the reflective mindset, we are poised to take in as much information as possible: the reputation of the brand, the experience and emotional resonance the brand provides, and the specific pros and cons. In other words, we are looking for the brand to make a holistic case based on ethos, pathos, and logos—the building blocks that Aristotle tells us makes a compelling argument. Word of mouth, in particular, covers all three bases. Real-world experiences of those we trust tell us: whether they trusted the brand, the emotional experience of our friends and family (whether the product/service made them feel good, happy, satisfied), and the benefits of the product/service. Moreover, we’re more likely to listen to people in our personal lives than we are to watch a testimonial on a landing page or read through product specs. 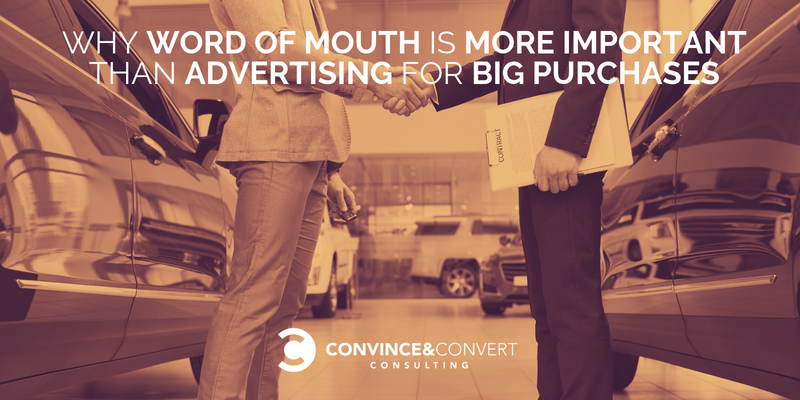 So if your company sells a product/service that involves cost, commitment, or consequences, ask yourself: are we doing enough to encourage and facilitate positive word-of-mouth? And download “Chatter Matters: The 2018 Word of Mouth Report” for more insights.